Rubio Monocoat Smoke has been especially developed to provide an ammonia-smoked aspect to oak. This product reacts in accordance to the amount of tannic acid that is present in the wood. When treated with Rubio Monocoat Smoke, oak will age. The treatment allows you to create very unique effects since the darkness of the aging depends on the amount of tannin in the wood. 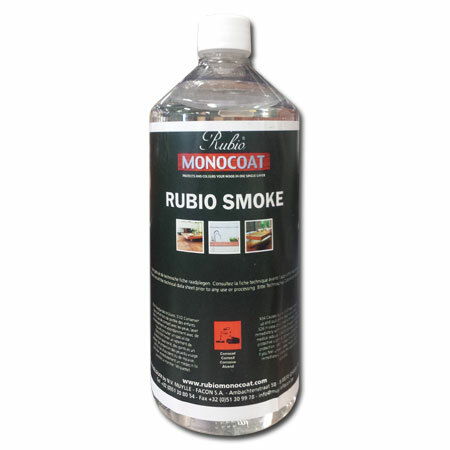 Rubio Monocoat Smoke is user friendly and does not release any toxic or irritating fumes or vapors. The product is designed to be post treated with Rubio Monocoat Oil 2C. - Can be post-treated with Rubio Monocoat Oil 2C. - Provides a similar aspect as an ammonia-smoking treatment. - Environmentally friendly, releases no toxic fumes or vapors. - Sand the planks until the desired result has been obtained. - Remove all dust from the surface. - Apply Rubio Smoke evenly with a roller, brush, water base applicator or spray gun. The surface should be fully saturates with the product. - Once the wood dries, wash off the surface with water. Damp mop or wash with clean dampened cloths. - Allow the wood to completely dry. - Remove the raised grain by polishing the surface with a buffer and a red or beige pad. - Make sure the surface is made fully dust-free again. - Apply Rubio Monocoat Oil Plus 2C. Consumption: Depending on the method of preparation and the type of wood: +/- 100 to 150 s.f./liter.